Sometimes backing down can be a good thing, it simply means agreeing to someone else and realizing you weren’t as accurate as you had though. Other times backing down means bending to the will of someone else, and not feeling strong enough to really stand to someone. 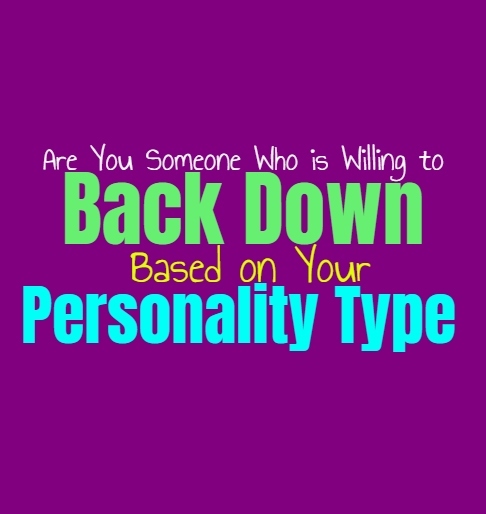 Here is how you feel about backing down and how willing you are to do so, based on your personality type. INFJs can struggle to really back down, since they do have a stubborn streak in them. When they are truly focused on something they don’t want to flounder or back down simply because they are challenged. They especially do not quit or back down when they know they are right, and what they are standing for is good. INFJs however, are willing to back down when they know they are wrong, or when someone they love has expressed the proof to them. They are often complex people, who can be both stubborn and flexible at the same time. ENFJs can be somewhat stubborn people who don’t like backing down when they feel they are right. Once they have committed to a choice is become difficult for them to really bend or back down. ENFJs are often more strong-willed than people realize, since they are also very caring and empathetic people. They are complex which can make them both stubborn and flexible. This all depends on the person they are dealing with, and just how connected they are to the situation and their decision. INFPs can certainly be stubborn people, especially when they believe in something. When they truly feel something in their heart, then it becomes difficult for the INFP to really back down. They don’t want to just give up when they have something to stand for. INFPs are willing to back down with people they love, since they definitely don’t enjoy discord. While INFPs do try to avoid too much discomfort, when they feel something to be true deep in their souls, it becomes impossible for them to just back down or walk away. ENFPs can be rather stubborn people and so backing down isn’t something which they can easily do. When they really want something or believe in it, they want to stand their ground. ENFPs believe in being true to themselves and always want to go after the things which inspire them. They rarely back down to others, even if they might not be right. They need someone to obviously and clearly prove that they are wrong for the ENFP to concede the argument. INTJs are naturally headstrong people, who don’t easily back down to others. When they stand for something it is because they have already spent time and energy researching and ensuring its validity. For the INTJ simply backing down means they are giving up on something when they should not be doing this. They will continue to fight and argue that they are right, until someone is actually capable of providing them with solid proof to the contrary. ENTJs do not back down, most of the time they are driven and stubborn people. When they stand for something or want to achieve a goal, they will stop at nothing to accomplish this. ENTJs do not simply suggest that something is right without spending time researching and ensuring that this is the case. For the ENTJ to back down the other person needs to prove without a shadow of a doubt that the situation isn’t as they had previously believed. INTPs can certainly be headstrong people, who don’t believe in just backing down. When they believe in something it because they have spent time researching and learning about it. INTPs do enjoy a good debate, and want people around them who are capable of keeping up. If the INTP sees that someone is sincerely providing facts to the contrary, they will take this into account and want to really help them learn and grow. ENTPs can be stubborn people but that doesn’t mean they aren’t opening to other things. They don’t back down easily mostly because they want someone who is willing to challenge them. ENTPs enjoy debating different subjects, and enjoy being around people who can keep up with them. ENTPs sometimes stand their ground on things they don’t fully believe in, simply because they want to see it proven. This helps them really dive into the information and ultimately learn more about it. ISTJs can be rather stubborn people when they are focused on something. They don’t back down easily, especially when they are working towards something important. They believe in standing up for themselves and don’t want to let anything stand in their way. This doesn’t mean ISTJs are incapable of accepting when they are wrong, they simply won’t back down without proof and solid evidence. ESTJs don’t back down easily, even if they are wrong about something it becomes challenging for them. They work hard to be efficient and for them being wrong feels like a serious failure. When the ESTJ believes in something or wants to achieve a goal, they will do whatever it takes to make this happen. They don’t back down easily to people, instead they often stand their ground and can be extremely stubborn. ISFJs don’t back down when they are doing something important for their loved ones, but there are times when they are willing to bend with certain things. ISFJs don’t want to disappoint others and so they are natural people pleasers. This desire to make people happy can sometimes make it challenging for the ISFJ to really stand their ground if someone they love wants them to back down. They can be strong-willed when the situation calls for it, but they aren’t incapable of backing down when something just does not seem important to them. ESFJs can be somewhat stubborn people when they are working on something important to them. They want to be able to achieve their goals, and don’t often back down from a fight or struggle. They do however, want to make their loved ones happy and sometimes this can cause them to back down for the sake of the people they care for. ESFJs want to please others no matter what and because of this they are willing to back down if it seems right. ISTPs don’t really back down easily, especially when they are heading towards something they want. They are willing to back down when the situation isn’t all that important to them, since they aren’t fans of the drama or arguments. When the ISTP does see someone spreading lies, this is when they will refuse to back down. They believe in standing up for the truth and ensuring that facts and being spread, not false information. ESTPs don’t back down easily and can actually be somewhat stubborn people. They do have a desire to win arguments which makes it difficult to get them to concede. When the ESTP is focused on something they don’t back down, and will do whatever they must to keep moving forward. They also have a tendency to fight for what they believe in until someone proves them wrong without a shadow of a doubt. ISFPs can be surprisingly stubborn people when they are around the ones they love and trust. When they know they can count on someone they are more likely to stand their ground in the presence of this individual. In other circumstances ISFP might be more likely to back down, since they dislike any type or arguement or stress in this way. For them discord is draining and so they do try to avoid it where they can, as long as it isn’t going against their morals. ESFPs are definitely headstrong people and because of this they don’t back down when they truly want something. They push themselves forward, wanting to stand their ground for the things which inspire and excite them. When it comes to backing down, ESFPs only do this when they don’t care that much about something, or when they are intimidated by a certain individual who is pushing them to concede.